I love a good plate of nachos. Especially piled high with chicken, cheese, and bacon. Top it with smoky BBQ sauce and homemade queso and I'm drooling! Now I know it's not the healthiest of meals but a girl has got to splurge once in a while! And tonight's dinner was a definite splurge! In a large bowl combine chicken and bbq sauce. Mix well and set aside. Arrange tortilla chips in a casserole dish. Pour queso evenly over chips. Top with bbq chicken. Add bacon and then shredded cheese. Bake for 15-20 minutes or until cheese is melted. Top with jalapeno slices, tomatoes, and shallots. Enjoy! In a small saucepan over medium-low heat combine all ingredients stirring often until cheese is smooth and starting to bubble. I love nachos, too. These sound delicious. I love me some nachos, and these sound really interesting with the BBQ sauce! Girl!! I love your recipes and when I saw this title I knew this was something I would add to my HAVE to try list. Good morning! Thanks for visiting my blog and commenting. 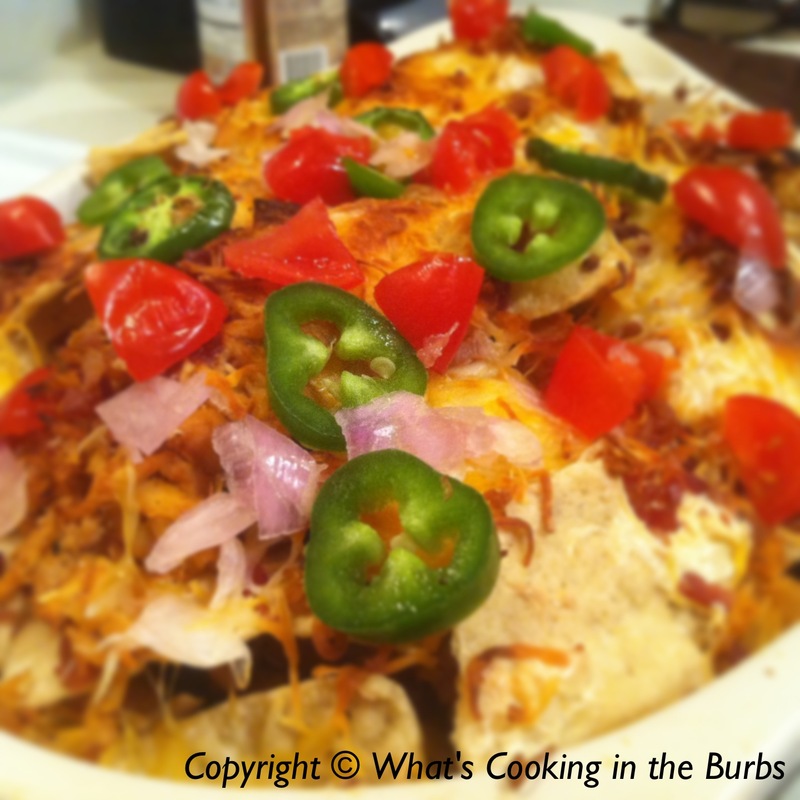 I wanted to return the favor and the photo of those nachos makes me hungry! I am allergic to chicken though so would it work just as well with ground beef or shredded pork? We love these kind of flavors around here. These sound delish! Hot right out of the oven dripping with cheese.... in my dreams! This looks amazing! My entire family loves natchos & more loaded, better.